I know of no other book that encapsulates in just 86 pages the essence of Tibetan Buddhism like Guru Yoga does. 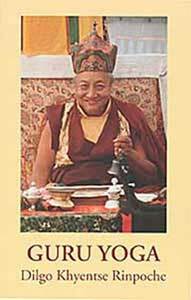 The author, Dilgo Khyentse Rinpoche, had me from his very first words. This extraordinary adept and teacher of Tibetan Masters is unfortuantely no longer with us in the form you see above. He made the transition in 1991. But he left a record of this teaching for all in an unfolding elegant style that pullls the reader in. Even the intricacies of Tibetan meditation for advanced students are made accessible. While the beginner may want to read another book by the Rinpoche, The Wish-Fulfilling Jewel as an introduction, this one can stand alone. Its contents and practice forms the cornerstone of Tibetan Buddhism. "When thoughts arise, we imagine ourselves once more as Vajrayogini, with Guru Rinpoche above our head. There is no need to do an elaborate visualization of the retinue and all the other details. Simply maintaining the presence of the guru above our head, we carry a strong feeling of devotion throughout all our daily activities. The essence of Guru Yoga is simply to remember the guru at all times: when you are happy, think of the guru; when you are sad, think of the guru; when you meet favorable circumstances, be grateful to the guru; and when you meet obstacles, pray to the guru, and rely on him alone. When you are sitting, think of the guru above your head. When you are walking, imagine that he is above your right shoulder, as if you were circumambulating him. When you are eating food, visualize the guru at your throat center and offer him the first portion. Whenever you wear new clothes, first offer them to the guru, and then wear them as if he had given them back to you. At night, when you are about to fall asleep, visualize Guru Rinpoche in your heart center, the size of the first joint of your thumb, sitting on a four-petalled red lotus. He is emanating countless rays of light, which fill your whole environment, melting the room and the entire universe into light, and then returning to absorb into your heart. Then the guru himself dissolves into light. This is the state in which you should fall asleep, retaining the experience of luminosity. If you do not fall asleep, you can repeat the visualization again. When you wake up in the morning, imagine that the guru emerges from your heart and rises up to sit again in the sky above your head, smiling compassionately, amidst a mass of rainbow light. The book ends with "The Guru Yoga Practice, from the Preliminary Practice of Longchen Nyingtik." It's about ten pages of recitations in English and some mantras that definately delivers a radiation and invites the presence of the MasterPadmasambhava.